Evaluating mobile applications and devices is particularly challenging given the variability of users, uses, and environments involved. 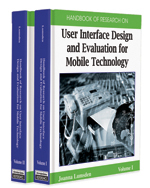 This chapter introduces usability evaluation methods (UEMs) for mobile applications. Over the past decades various usability evaluation methods have been developed and implemented to improve and assure easy-to-use user interfaces and systems. Since most of the so-called ‘classical’ methods have demonstrated shortcomings when used in the field of mobile applications, they were broadened, varied, and changed to meet the demands of testing usability for mobile applications. This chapter presents a selection of these ‘classical’ methods and introduces some methodological variations for testing usability in the area of mobile devices and applications. It argues for a combination of both field evaluation methods and traditional laboratory testing to cover different phases in the user-centered design and development process. Inspection-Oriented UEMs: A set of methods used by experts and most commonly based on guidelines to investigate possible usability problems. Context: Mobile services and devices that can be used in various places and situations, by a single user or involving others. These circumstances are described as context of use or usage context. Experience Sampling Method (ESM): An in-situ method especially suitable for collecting quantitative and qualitative data with mobile and ubiquitous systems. ESM studies user experience factors in a natural setting, in real time, and over a longer period of time. Usability Evaluation Methods (UEMs): A set of methods used to evaluate a system, mock-up, or prototype in terms of usability. Cultural Probes: An inquiry method aimed at inspiring, revealing, and capturing individual lives in different contexts, like at home, at work, or on the move. In-Situ Evaluation Methods: A set of methods used to evaluate a system or prototype in its real usage context. Usability Test: Performance measurements of users to determine whether usability goals have been achieved.